Rubbermaid thought of everything when they constructed this garbage can. 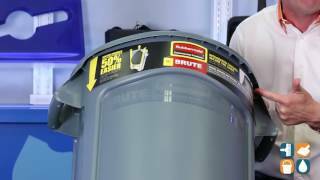 This Brute 32 gallon trash can is a durable and reliable option for both the residential and commercial environment. The seamless design is made of polyethylene, an all plastic professional grade material that will not rust, chip or peel and is dent-resistant. The reinforced rim helps to add strength and durability, qualities that are standard for Rubbermaid. This Rubbermaid 2632 round garbage can also features a double-ribbed base to help increase stability and dragging capacity. The built-in handles allow for easy, non-slip lifting and jam-free nesting in storage. Venting channels allow for easy removal of liners, preventing injury. 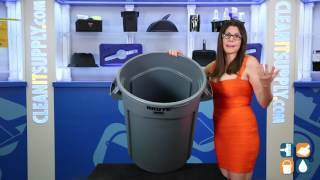 With ample room inside and durable construction, this Rubbermaid 2632 32 gallon trash can is the ideal trash receptacle for home or business. Strong, snap-on lids are available (sold separately, RCP2637-88, RCP2631, RCP3543A). 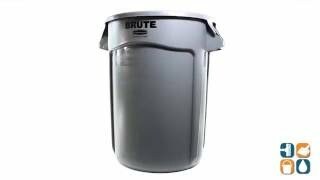 The dimensions for this Brute 32 gallon trash can are: 27-1/4"H x 22" in diameter. Used for our garage maintenance team. Great product!